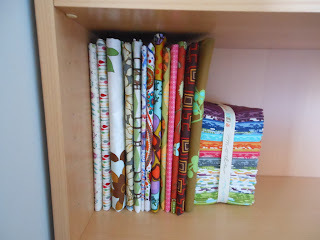 Fabric shelf progress, a photo by capitolaquilter on Flickr. I managed to make it through a package of boards before running out of pins and running out of steam. My local comic book store has plenty so I just picked up three (100 in each) to get started. Fortunately I've found that I enjoy the process of boarding my stash. The fixed shelf forced the top shelf to be shallow which is fine because my Echino and other Japanese imports look nice laying flat. The width on the organic cotton from Birch Fabric is a bit generous so it didn't fold well on the boards and gets a top shelf along with my precious FQ bundle of Notting Hill and Simply Color. Thanks for the input on flickr and facebook about the clearance needed at the top edge of the bolts. I decided that a fingers spacing was enough. One of my pet peeves when I'm shopping is when they are crammed in too tight. Now that I'm faced with the dilemma of fitting more in than I have room for I can relate. Even so, I'd rather have less on the shelf that you can get at than have it all fit and struggle to pull out what I want. The bottom shelf ends up having a bit more height to it which is great because I was thinking of keeping my iron down there. 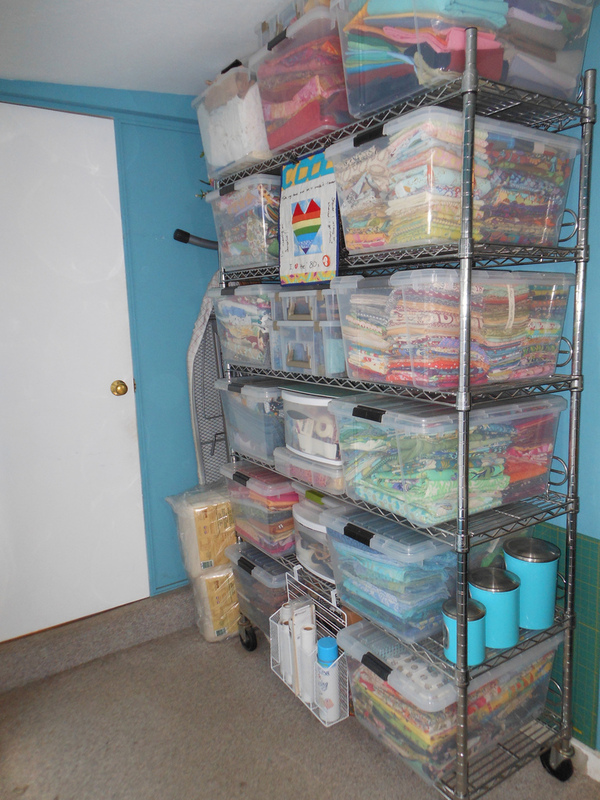 At this point I"m only boarding a full yard or more so the FQs may go in containers on that shelf as well. The overall layout is a work in progress but at least I'm moving forward finally. Wow - you have made organization look beautiful! Now I'm thinking I'm going to have to do something like this because some of my fabric has started hiding from me...I'd like to see more of my fabric when I work on projects. You have everything at your finger tips - congratulations! I forgot to ask this question - why does a comic book shop sell fabric boards? Do they have other purposes? Gorgeous. I love those fabrics. And you are so organised. Looks great so far! I put 1/2 yard and up on boards, Smaller pieces and fat quarters are on boards that I cut in half and stack them in photo boxes. I have shelves that my husband made for me many years ago that I never painted. I hope to do that this summer and reorganize everything then. I did the same thing with the comic book boards. Love it! And you can fit so much more on a shelf that way.